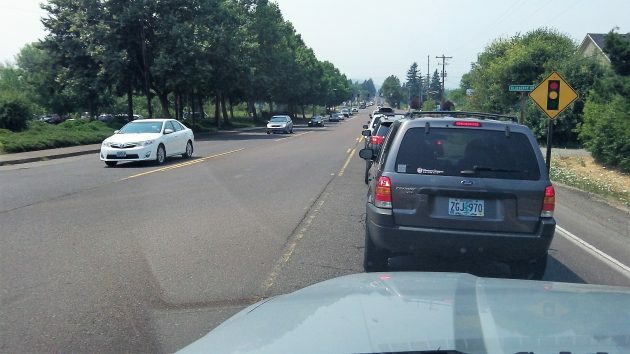 Long line of vehicles leaving the valley westward as the temperature climbed toward 100 Wednesday. If the hottest time of a very hot day comes around 5 p.m., what good are “cooling centers” that close at 4? That’s what I’m wondering after reading the latest heat-related press release from the Benton County Sheriff’s Office. The list of cooling centers included some that were open into the evening, including Helping Hands shelter and the Salvation Army in Albany and the Community Outreach Center in Corvallis. But it also listed some that would be open only till 4, including the Albany and Lebanon senior centers and the Bonaventure retirement community in North Albany. This is the latest attempt by the Trump Regime to thin the ranks of those sucking at the Social Security teet. Toss the geezers out onto boiling streets at the peak of the sun’s power. Social Security savings the easy way. Who said Trumpster isn’t smart? He isn’t, but this plot should work well. And, if they can pull it off in a town like Corvallis, a den of liberal iniquity, then the plan can work anywhere. How do you know it’s not enticement by the senior “living center”? Sign up now or fry! Odd, perhaps my eyesight is failing’ but, I did not see TRUMP used once in Hasso’s information. Benton County, Senior Centers, etc. but no Trump. For pete sake, quit blaming every thing on Trump. I don’t necessarily agree with much of what he is doing but he can’t be at fault for everything. No. 45 is on all of our minds though. Trump IS the principle reason why America has become an 800-lb. laughing stock. As odorous as the man is, his incompetency is far more troubling. Compared to Obama. Get real man. Some things will never change …..Blame Obama. Are those things both old & white?